A few days ago, I read the following post; Extracting Data from BICS / Apex via RESTful Webservice on the Oracle A-Team Chronicles website. I tried the example to see how things work. In the blogpost is referred to cURL to test the REST-endpoints. I have been testing this out on a Mac and used; Cocoa Rest Client. 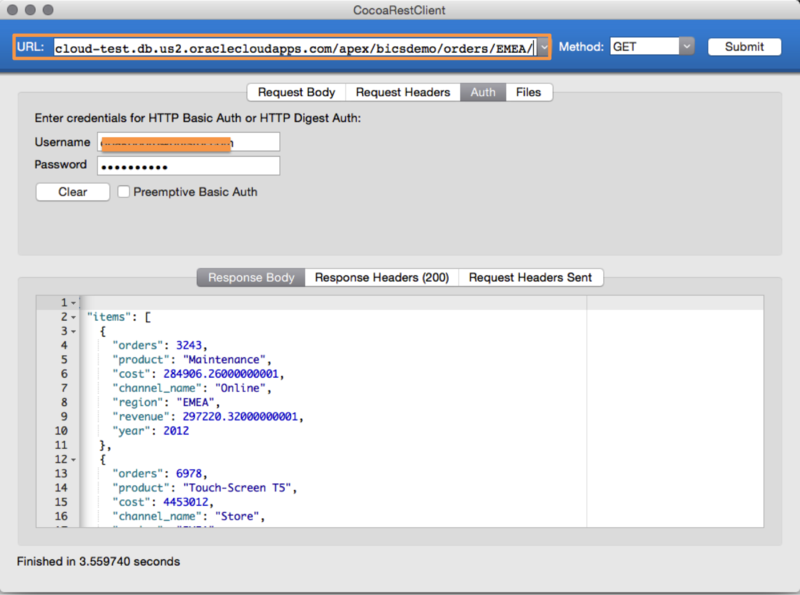 If you test the created RESTful Service Handler, you get a window with a JSON formatted result set. You can copy the url. Enter the copied url in the Cocoa Client. You will find the result in the Response Body of the CocoaClient. Don’t forget to enter your credentials to your BICS environment. Next Post Het bestaande hoeft zich nooit te verdedigen en het nieuwe moet zich constant verantwoorden.